...the most seductive designs in the new Secc shopping trolleys collection. Secc trolleys are manufactured to a very high standard & quite simply built to last! Some even say they are built like tanks, yet additionally light weight and easy to manoeuvre. The oversized soft smooth rolling wide wheels means this Secc trolley glides effortlessly over obstacles and rough terrain such as pebbles, grass, sand, snow and can even easily be pulled up steps & stairs! The large capacity bag and extra strength frame means you can store a heavy load with ease, perfect for your weekly shopping & more! 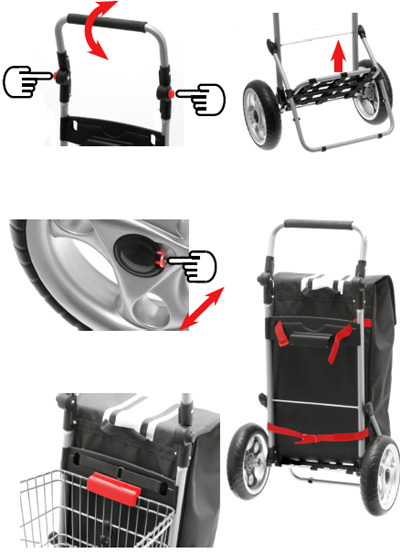 When the trolley is not in use the bag + wheels can be removed and the frame collapsed down to store away neatly. Secc trolleys are truly in a class of their own when it comes to design & durability. Easily removable and washable bag. Guaranteed for 2 YEARS against defective workmanship and materials. Damage due to wear and tear, misuse is not covered by the guarantee. Great service and prompt delivery. The trolley itself seems a quality product, easy to use and well made. Very happy. WHO SHOULD BUY A SHOPPING TROLLEY? Earlier on I thought elderly or people or with a disability. Now I think EVERYBODY!!! Service Very good, Product Excellent.